David was born on November 13, 1936 in Upper Sandusky, Ohio. He is a graduate of Upper Sandusky High School and Ohio University. During his years at Ohio University, he participated in football, earning three letters. He was also active in student government, serving as president of his social fraternity. David attended the Ohio State University College of Law, graduating in June, 1964; he was admitted to the practice of law in 1965. 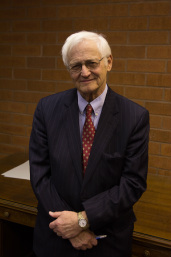 After working for the Ohio Legislative Commission for a year, he joined the firm in 1965. David is an avid outdoorsman. He has owned a boat for many years and enjoys fishing and cruising on Lake Erie. He and his wife enjoy traveling overseas; they have visited Canada, Europe, South America, Alaska, and the Far East many times. David resides approximately five miles west of Findlay with his wife, Gwen. He is currently a member of the Findlay Rotary Club, Findlay Elks lodge, the Findlay-Hancock County Bar Association (President, 1977), and Ohio State Bar Association.